On the map you can see a small town with a few skyscrapers and a huge stadium. 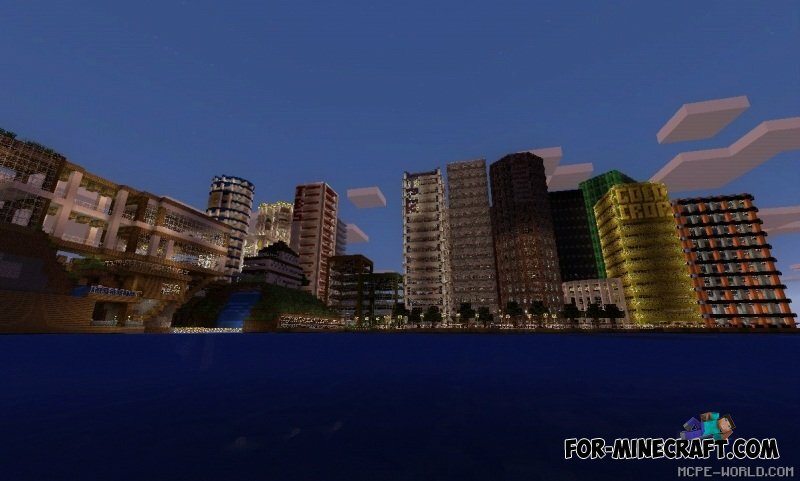 You will be able to explore the interest of all these buildings, and on the football field could be if you want to play with your friends in football. Rumor has it that this map is infinite. Once on it, you immediately flee eyes. Many saw this map on the servers. For it created a lot of mods. It was visited by hundreds of Youtube players. Capture the Wool - map for 12 players with six players on each team. Map starts in the same space where all players spawn. Here you will have to split into two teams and then disperse in two different directions. Take a ride on the indoor roller coaster called Santa Claus, discover the journey to Wonderland !!! Explore a variety of scenes and enjoy the ride! Like Santa Claus on a sleigh ride to the heights like never before! This is probably the best roller coaster on which you have ridden this season Enjoy !!! On the «BUS» map built a stunning layout of the American bus in very high resolution! Dimensions and details of this bus is shocking and at the same time surprised, bus built with maximum detail all the details, just to precisely follow the proportions of the design of the bus, and parts of the interior of this American bus. On the map, Steve built a huge beard, which holds all the forces huge island on which is built a huge house with a small garden in the backyard.